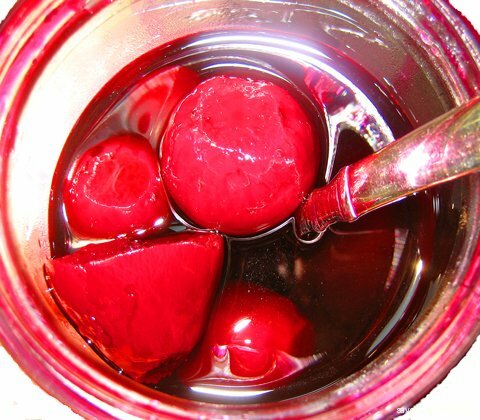 Tender years at home: Pickled beets - yummmy. Harvard beets: even yummier because of the warm red gooey sauce. Plain beets -- icky. Scary even. Beet greens? Whaaaaaaat? At best, rabbit food. Peeling cooked beets: possibly the funnest job in all cookery. After leaving home: Exactly the same as above. For years, years, years. Breakthrough moment: With trembling fork, I taste a fresh, sweet, completely unadorned cooked baby beet because it showed up beside my entrée at the wonderful a la lucie Restaurant. Big news: Beets are SWEET! Farmers Market shopper years: I buy a few fresh small beets at a time. I boil, skin, and finish them with a touch of butter and salt in a hot skillet. Or I roast them with a little olive oil and salt, skin them, and serve. Household ratings of my cooking go up noticeably. We learn to pickle our own beets: And then the time came when we had to take over, locate beets, find a recipe that tastes nearly like Dad's. I realize beets grow like weeds, and my excellent live-in gardener-mate/main man starts growing them: That was last year. We discover that we can have fresh beets from our own garden for most of the growing season. Yes, I'm a slow learner, given that I grew up (see "Tender years at home," above) surrounded by rows of beets in countless productive gardens. Discovery: some people actually LIKE and EAT beet greens: Our housemates for the past wonderful year eat a fine veggie-rich diet. Imagine my surprise -- given that I always push away the little baby beet greens in mesclun mixes -- when I watched faces light up over the abundance of fresh organic beet greens for fresh green salads and garlicky sautées, both. So all the beet is edible, then - even the skin, sometimes, though skinning a cooked beet still amounts to the best fun in cooking. TODAY! Our gardens and some local farms, including Elmwood Stock Farm, Raggard Creekside Farm, and Pittman Family Farm all continue producing beets. Other farms are likely to produce small, sweet fall beets in September and October. What to do with all the beet bounty? Just in time, food writer Dianna Marder of the Philadelphia Inquirer interviewed some Philly chefs and got excellent info ("red beets are superior in flavor to the yellow, gold, and candy-striped varieties") along with fine-sounding recipes like Quick-Roasted Beet Slices, Chilled Spicy Summer Beet Soup with Peaches and Dill Cream, and more. What's next in the Beet Progression? I am guessing more wondrous recipes, given that some chefs seem to take the Eater-in-Chief's resistance to beets as a personal challenge. If great chefs will devote some attention to developing recipes that hide the green parts of beets inventively, I may have a Beet Greens era yet to come. The world is coming to visit central Kentucky this year for the Alltech FEI World Equestrian Games. To help our visitors know more about Kentucky's food and food ways, Savoring Kentucky is rolling out 116 Savory Kentucky Bites, one for each of the 100 days before WEG begins, and 16 for the days during WEG, September 25 - October 10. Today's Savory Bite is number 59.